The culture of posting food photos on social media has put pretty much everyone in the same place: We’re all guilty of it from time to time ... and we all sort of hate it. That’s just the kind of reputation you get when you’re a massively popular superstar. Now, a photo-printing company called CEWE Photoworld has decided to take an quantitative approach to the behemoth that is #foodporn. 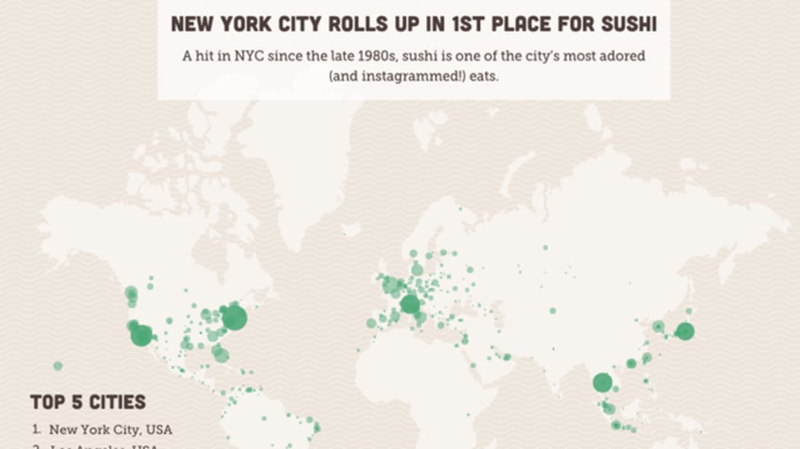 With Instagram’s open application programming interface (API), Photoworld was able to analyze 100,000 photos and turn them into an interactive map showing how the world posts about food. Based on hashtags around the globe, we now know for sure (though there might have been a sneaking suspicion already) that New Yorkers are the kings of bacon photography—almost 8 percent of bacon tags came from the Big Apple. Australia loves Banh mi, Los Angeles posts more about Korean barbecue than Seoul (burritos too), London loves its burgers, and well, poutine pretty much stays in Canada. To feed the food photo beast within, grab a snack and navigate over the nom-worthy map.